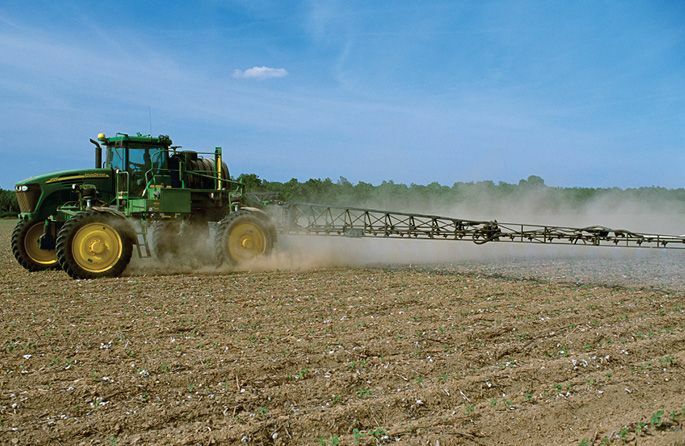 Glyphosate is sprayed on many crops in the U.S.
A new analysis has concluded that exposure to a chemical found in the most widely used weed killer in the world raises cancer risk by 41 percent. The connection between glyphosate, a key component of Roundup, and non-Hodgkin’s lymphoma has long been the subject of fierce scientific debate, reports The Guardian (U.K.). The World Health Organization concluded in 2015 that the herbicide was “probably carcinogenic to humans”—a finding rejected in 2017 by the Trump administration’s Environmental Protection Agency. For this new research, scientists at the University of Washington analyzed all available published studies on the issue. Focusing in particular on people with the highest levels of exposure, such as farmworkers and groundskeepers, researchers found a “compelling link” between the chemical and disease. “All of the meta-analyses conducted to date, including our own, consistently report the same key finding,” the authors conclude. Monsanto, which makes Roundup, and the agro-chemical company’s German owner, Bayer AG, are already facing 9,000 lawsuits from people who claim the glyphosate damaged their health.